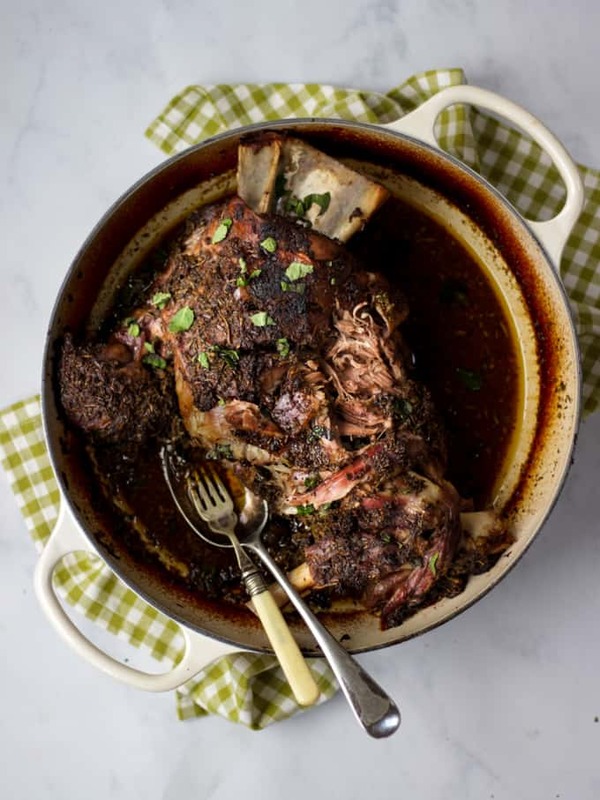 Deliciously soft and tender, pull apart Slow Roasted Shoulder of Lamb – Baked in the oven, low and slow with a herb coating giving a crunchy crust. 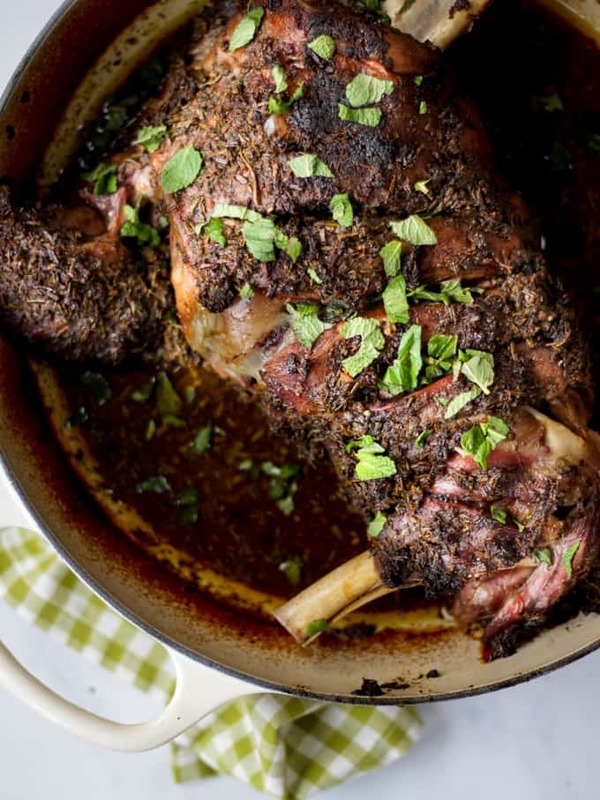 Full of the flavour of rosemary, mint, garlic and lemon this Slow Roasted Shoulder of Lamb recipe is a real crowd pleaser. There is something just so homely and comforting about deliciously tender slow cooked meat isn’t there? It’s my favourite way to cook meat during the cold months of winter. Even if spring is (hopefully) on the way, it definitely doesn’t mean that you need to stop using the oven to slow cook meat. 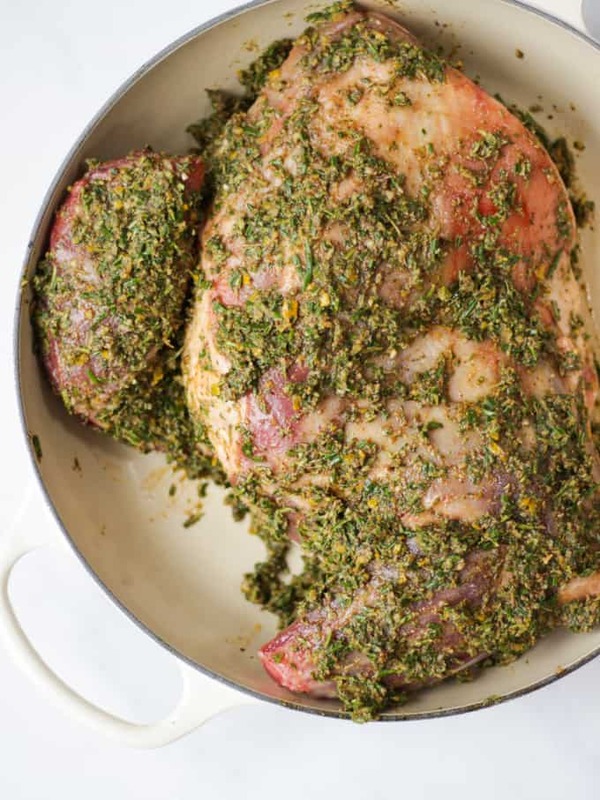 At this time of year, I like to give it a lighter, fresher flavour by adding piles of fresh herbs and zesty lemon to lamb. You still get the meltingly soft meat, but with the herby taste of warmer days. This Slow Roasted Shoulder of Lamb is my favourite way to combine herb flavours with slow roasted meat. It doubles as Pulled Lamb, leftovers make an amazing Shepherd’s Pie, oh and it’s perfect for Easter, when it’s traditional to serve lamb. I start by making a herb rub or coating by blitzing the herbs, garlic and lemon zest. Slash some cuts into the lamb skin and rub it in all over. It’s best to use clean hands to do this and really get stuck in. Pop it into a gently preheated oven and allow it to cook away for the afternoon. The delicious wafts will fill the kitchen, letting you know it’s ready. You can serve this Slow Roasted Lamb Shoulder as a normal roast, with roast potatoes, vegetables and use the cooking juices (drained of fat) as gravy. Can you slow cook lamb shoulder? Yes! Lamb shoulder is the perfect cub of meat to slow cook. Bones in to give added flavour and plenty of stripes of fat to cook down and keep the meat meltingly soft. The fat can be drained off away from the pan at the end of cooking. What temperature to slow roast lamb shoulder? This recipe cooks at 140C which is 320F or Gas Mark 3 for about 4 hours. I find this gives the perfectly melting and soft lamb shoulder that you’re looking for. How long does it take to cook a shoulder of lamb? At this low temperature, the lamb needs to be cooked in a lidded casserole dish for about 4 hours. You can test at 3.5 hours. See the tip below for crisping the lamb if it needs it. I use my beloved little Mini Food Chopper to make this rub. It is SO useful and a brilliant buy at about £13. I like to cook this in a lidded casserole dish so it doesn’t dry out. The one in these photos is available here on Amazon. An investment buy but I use it so much, it’s been worth it. If the lamb crust isn’t crispy enough at the end of cooking, turn the oven up to 220, remove the lid and cook for the last 20 minutes at that high temperature to crisp it. You can also serve this as Pulled Lamb. Remove all of the cooked lamb from the bones, shred and serve with tortillas, sour cream, cheese, avocados and lime wedges. Delicious. 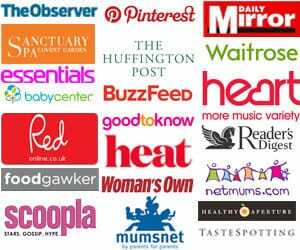 Fancy some other slow cooked meat recipes? How about my Beef Stifado or Slow Cooker Chicken Cacciatore? Hope you enjoy this recipe as much as we do. 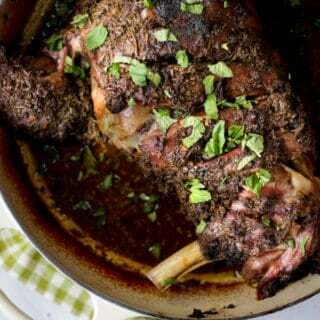 I’d love to know how you got on and what you thought of it if you make this Slow Roasted Shoulder of Lamb recipe. Please rate the recipe and leave me a comment below if you do. Deliciously soft and tender, pull apart Slow Roasted Shoulder of Lamb - Baked in the oven, low and slow with a herb coating giving a crunchy crust. 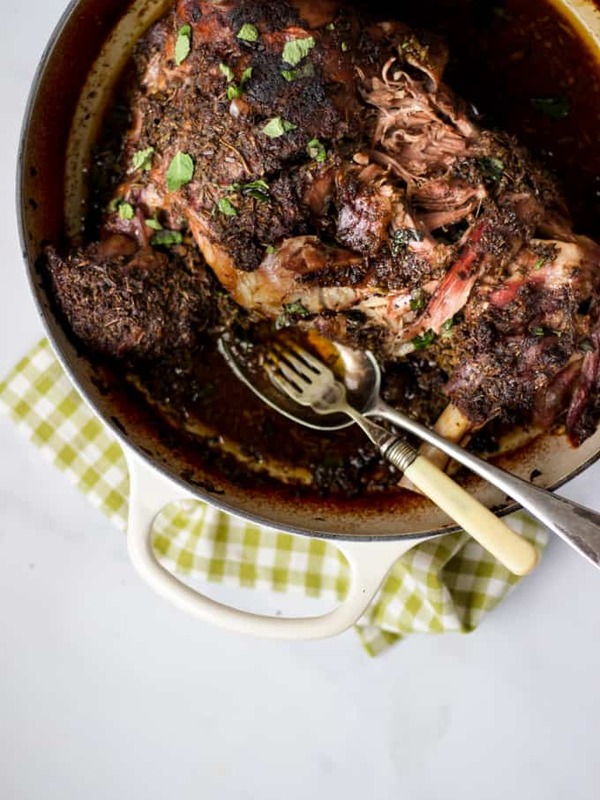 Full of the flavour of rosemary, mint, garlic and lemon this Slow Roasted Shoulder of Lamb recipe is a real crowd pleaser. 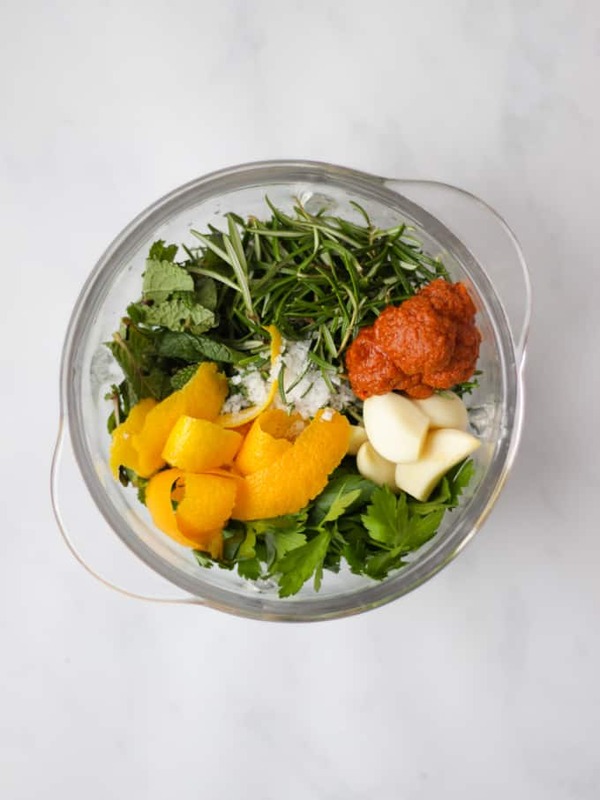 Blitz together the mint, rosemary, parsley, garlic, lemon (zest only! ), cumin, sun-dried tomato paste, salt and pepper and olive oil. Add more olive oil if needed to make a smooth paste. Rub all over the lamb shoulder in a lidded casserole dish. Put the lid on and cook for about 4 hours, until the meat pulls apart with a spoon. « Microwave Fudge Recipe – TWO Minutes TWO Ingredients! Hey Sarah, your lamb recipe looks very yummy! I can not wait to make one at home. Is it easy to make? Hi Jina, yes it’s super easy!